The holiday season should be about giving, but at the end of the season, most people can’t help but think it’s all about spending and money out the door. What would happen if you and other family members considered a different gift this holiday season – the chance to build your financial awareness with a trained expert? Financial planning is an investment. It costs money. But its potential returns are manifold – a chance to get a handle on current problems with spending, debt and investing and a long-term opportunity to diffuse fear of financial issues by learning everything possible about them. It doesn’t matter if you are a single working individual or a family with kids still at home – the right financial planner can be a long-term partner in re-educating everyone in a household about money and the right ways to handle it. For many people financial planning is a reaction to an emergency, such as a divorce, the death of a spouse or a sudden windfall. But in making the decision to do financial planning as an ongoing part of your life, you have the chance to fully review all your spending and investing decisions and maybe allow each of your family members to do individualized planning that will set them on a good course for life. What training do you have? Find out how long the planner has been in practice and what kind of certifications they hold. A CERTIFIED FINANCIAL PLANNER™ professional is someone with a minimum of three years who has completed a comprehensive course of study at a college or university offering a financial planning curriculum approved by CFP Board. CFP® practitioners must pass a comprehensive two-day, 10-hour CFP® Certification Examination that tests their ability to apply financial planning knowledge in an integrated format. Based on regular research of what planners do, the exam covers the financial planning process, tax planning, employee benefits and retirement planning, estate planning, investment management and insurance. What services do you offer? What a financial planner offers is based on credentials, licenses and areas of expertise. Generally, financial planners cannot sell insurance or securities products such as mutual funds or stocks without the proper licenses, or give investment advice unless registered with state or federal authorities. Some planners offer financial planning advice on a range of topics but do not sell financial products. Others may provide advice only in specific areas such as estate planning or on tax matters. •Salaried planners are actually employees of a firm, and you help pay their salaries through fees or commissions you agree to pay. 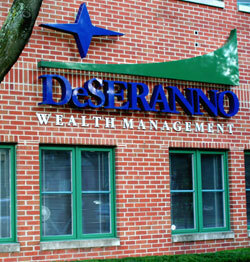 •Direct fees to the planner through an hourly rate, a flat rate, or on a percentage of your assets and/or income. •Commissions paid by a third party from the products sold to you based on the planner’s recommendations. Commissions are typically a percentage of the amount you invest based on those recommendations. Do you have any potential conflicts of interest? It may seem like a rude question, but the best planners expect this one and are prepared to make disclosure. Obviously, if a planner profits from the sale of investment products to you, she must spell that out. How do you feel about teaching and training? One of the primary benefits of having a financial planner is education about the moves you are making or may potentially make. Don’t view a planning relationship as tossing someone your finances so you won’t have to deal with them anymore. As long as you’re paying for their services, make sure you get a long-term education out of it. November 2009 — This column is produced by the Financial Planning Association, the membership organization for the financial planning community, and is provided by DeSERANNO Wealth Planning, a local member of FPA.